Galina Khmeleva is an amazing person and an even more amazing knitter. Galina's extensive knowledge and skills regarding the art of knitting in general, and lace knitting in particular, provides a treasure trove of information that will make every knitter find more confidence and joy in knitting. Galina's teaching skills have become legendary making her one of the most sought after knitting instructors of her generation. On a more personal note, Galina Khmeleva's working knowledge and understanding of post and present-day Russian history, particularly Russia's famed dance and music society, is absolutely fascinating. Topping all of this with the fact she has dedicated her life to keeping the Orenburg lace tradition alive will undoubtedly make cruising with her an unforgettable experience. Galina Khmeleva graduated high school in St. Petersburg, Russia, then attended Russian State College, trained in cartography, working for the Soviet government post graduation. In her mid-twenties, Galina's love and respect for all things crafty led her into the field of clothing design, working for both private clientele and Russia's famed theater aristocracy. Galina eventually travelled to the Orenburg region of Russia where she developed a close working relationship with the masters of Orenburg knitted lace. Galina, herself, became a master of this storied art form. In 1990, Galina Khmeleva became the first Russian woman invited to participate in the prestigious AIPT (Association of International Practical Training) under the auspices of the USAID, and traveled to the US to undergo months of an extensive work/study program that helped women worldwide become independent entrepreneurs in their home countries. And in 1995, as a direct result of her AIPT experience, Galina Khmeleva started her own company, Skaska Designs. Galina spends her time traveling both domestically and internationally, sharing her expertise and love of lace making with lace knitters, as well as, providing the necessary raw materials to knit stunning Orenburg shawls and scarves. Galina Khmeleva went on to publish Gossamer Webs, The History and Techniques of Orenburg Lace Shawls and Gossamer Webs, The Design Collection. Galina has also contributed to many articles and patterns for the industry's leading journals including Knitter's Magazine, Cast-On, Verena, Interweave Knits and is a frequent contributor to Piecework Magazine. 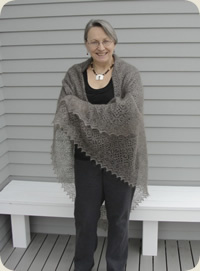 Galina is a member of The Knitting Guild of America (TKGA), Mountain & Valley Wool Association - Taos NM (MAVWA), and the International Old Lacer's Inc. (IOLI). Galina Khmeleva has earned much praise and international recognition for her knitting and spinning prowess, but perhaps most significantly, for helping bring knitted lace into today's mainstream knitting culture.